After six o’clock in the evening is an appropriate time for a man to choose darker suits and richer materials. 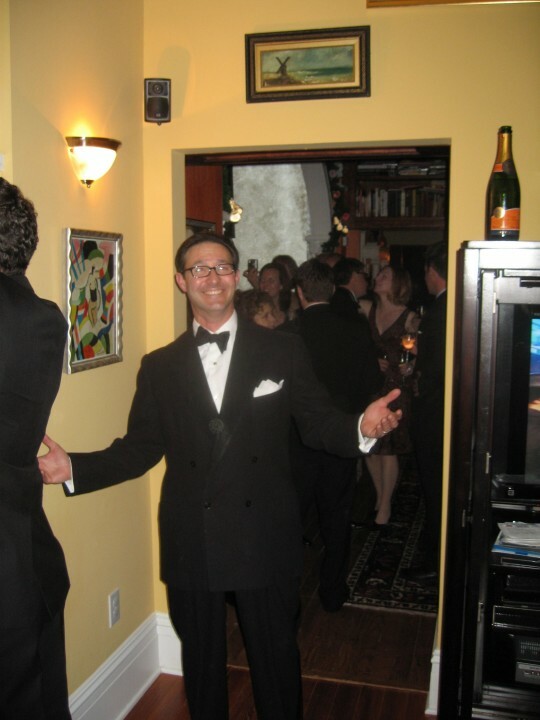 Of course, the ultimate after six garment is the dinner jacket; in fact, there was once a brand of tuxedo called “After Six.” Mostly rental stuff and fairly inexpensive. I know, I had one by the time I was sixteen and making the rounds of the stag line during the season. That’s it above, styled with the oh-so-fashionable attached wing collar, wings worn over the bow tie in an effort at insoucience. It took a beating. Although the dinner jacket may be the most elegant of evening attire, there is a case to be made for the midnight blue suit, or the Black Watch plaid jacket and odd trousers. That was the choice for a New Year’s Day Hoppin’ John party held down the street. That jacket shouldn’t have made it this far. Like my After Six dinner jacket, it had taken a beating. It was my father’s snazzy holiday choice during our stay in Holland in the 70’s. (You can tell that the lapels are a bit wide as are the flaps on the pockets.) Over the years it sustained a lot of moth damage. Particularly at the collar. I could have tried to have it rewoven (I’ve had great results with other garments), but I chose another route. The damaged collar and the buttons have been covered with Holland & Sherry green velvet. With its slightly flared skirt, high cut arm holes and deep side vents I think the effect is rather striking, somewhat reminiscent of the Edwardian revival stuff of the 1960’s. I chose to set it off with a white spread collar shirt and navy tie. After all, it is a lot of jacket and didn’t need the competition. With Tom Ford’s influence and Ralph Lauren reëxploring the wide lapel, this jacket will be fashionable enough for the next year or two and then I will have the lapels and pocket flaps narrowed. Incidentally, that slimming silhouette, the slightly longer skirt with deep side vents, hacking pockets, suppressed waist and a couple of other little touches will be seen again in the Easy and Elegant Life collection that I am developing with my tailor. Stay tuned. I plan to make it far too easy for you to be anything but elegantly attired. In the meantime, when in doubt, stick with a classic dinner jacket like this 1930’s 4 X 2 that was Mrs. E.’s grandfather’s. It looked great all through New Year’s Eve and will for many, many more. 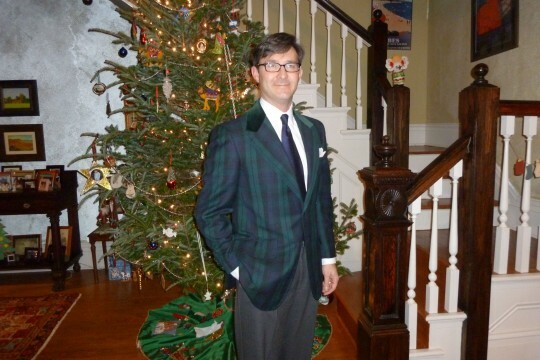 This entry was posted in Elegantology and tagged After Six, Black Watch Plaid Jacket, Elegant Evening attire, Holland & Sherry, Ralph Lauren, Tom Ford. Bookmark the permalink. easy and elegant life collection? wow- that’s some big news chris! awesome! i wish you much success and happiness for the new year! That party looks like a blast. I can actually hear muted party din when I stare at the picture! You’re wearing my tux! Well, probably. 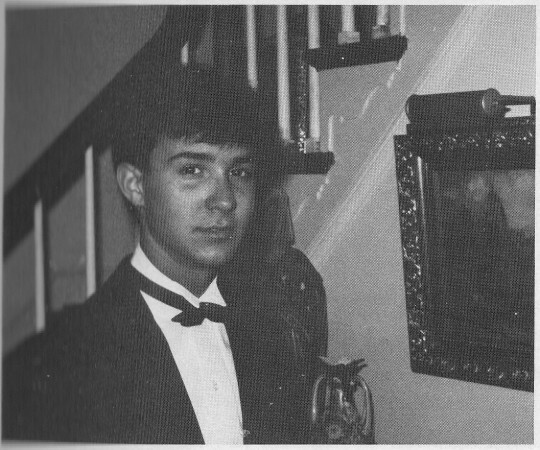 Yeah, I have almost that exact same photo….We had fresher faces back then, but at least you look far more distinguished now. Great Black watch jacket. As much as the occasion calls for it, the dinner jacket is sadly losing ground in Europe. Here in Rome, some hosts will wear a velvet jacket. No, not the 70’s Huggy Bear version from Starsky & Hutch days, but an elegant blue, black or bordeaux. Rather unique and distinguished. I have yet to get one, because I’ll trump them with my Black Watch dinner jacket when I host. But then, I have an awful reputation of hosting hard women and loose liquor parties with a strict dress code. At least, some actually enjoy my cooking…. You are always the best dressed at the party. Happy New Years Chris!! So excited to hear you are developing a line of men’s clothing! You are your own best endorsement! Thank you Katie. Nice to see you New Year’s. Thank you all for your best wishes and yes, the party was a ball. iCG, you will indeed rule the roost. My father used to have a velvet tuxedo. A bit much, but it was the 70’s and Europe. m21, thanks! For you too! 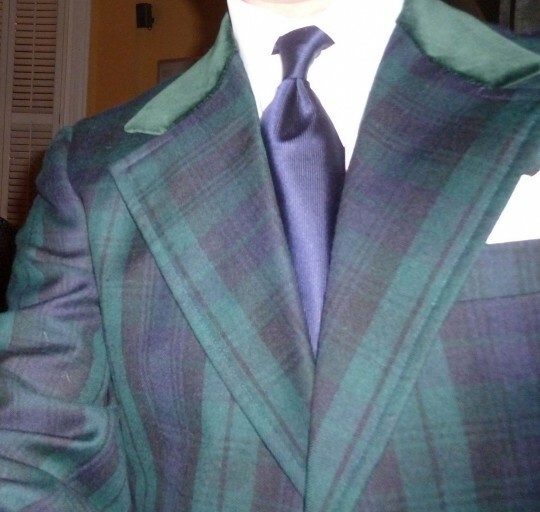 The Black Watch jacket looks great, and although not easily visible, the velvet additions sound ideal. I too used to have a blue velvet “smoking jacket” with gros grain lapels and cuffs, which I sometimes wore instead of the usual black. The climate here doesn’t actually suit this dress code, and very few if any where “Red Sea rig”, which they used to do in my father’s day in Asia.